When the day of Pentecost came, the apostles were all together in one place. Today is the day of Pentecost! You may want to read through the second chapter of Acts again. On that day the disciples received God’s power from above. It is a power that enables them to go out and out-live, out-think, and out-love the ancient world. They receive something extra, something new, something they did not have before. They receive power in their hearts. The flames of fire and the sound of wind are just outward signs that the Holy Spirit has been given to them. They receive what all of us desperately need: the Spirit of God filling us and helping us overcome the evil within and around us. We need to face the simple fact that to try to follow Jesus without the Pentecostal power of the Holy Spirit doesn’t work. We just cannot do it. 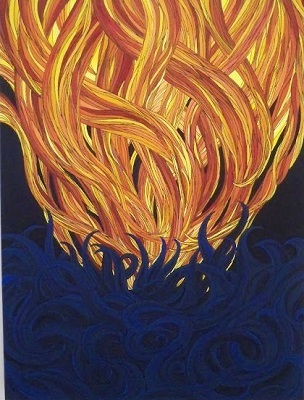 From a Biblical point-of-view, it appears that everything that happens before Pentecost is a preparation for this gift of Wind and Fire. This world was created so that in following Jesus Christ, we can have friendship with Abba, Father, and be given the Holy Spirit. God-made-flesh lived, died, and rose so that our eyes would be opened to the unfathomable depths of God’s love and we would be ready to receive God’s Spirit. The message of Pentecost is that there is a new power available, the very power of the Kingdom of Heaven. So can I invite you again to think deeply about the place of the Spirit of God in your life? Is the Spirit of God really at work in your life? Are you experiencing greater freedom in your walk with Christ? Are you growing in your capacity to love in the way that Jesus loved? Do you have some sense of God working through your words and actions? Perhaps you can reflect on these questions when you gather together in one place with other followers of Christ for worship. This is what the early disciples did on that first Pentecost. Pentecost happened for them together. This could also be your experience today as you join together with other Easter people to celebrate the outpouring of the Holy Spirit on the church. Whatever it is that that you decide to do today, few things are more crucial in the life of faith than remaining open and yielded to the Spirit of God. Easter people are Spirit-empowered people! Consider worshiping today with God’s people in a local congregation near you to celebrate the gift of the Holy Spirit.